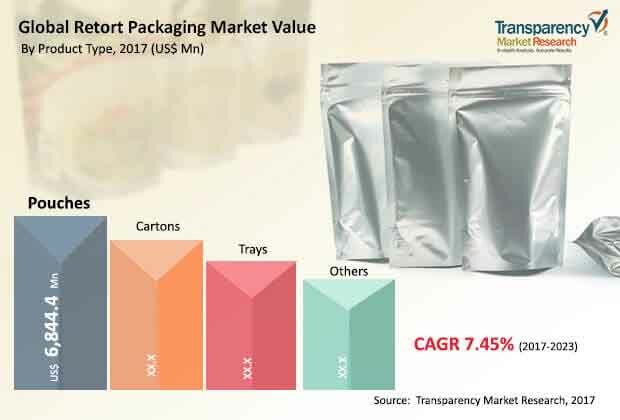 A recent business intelligence study done at Transparency Market Research (TMR) has foreseen that the future of the retort packaging market belongs to the development of ecofriendly products. And, this trend has been already seeped into R&D practices of several major players who are aspiring greater shares in the packaging industry. The analyst of the report has detected that the shares in the global retort packaging are distributed among a large pool of players. However, a few companies such as Amcor Limited, Mondi Group, Bemis Company, Inc., Sonoco Products, and Sealed Air Corporation do hold slightly stronger positions, which is a reflection of their robust supply network across regions and constant strive for innovation. Going forward, most of the major companies in the retort packaging market are expected align their product portfolio in sync with changing demand from the food industry. For instance, Amcor Limited offers products such as AluFix Retort Classic for non-demanding applications including meat and pâtés; Retort Pro for demanding applications including ready meals, fish salads, and olives; and AluFix Retort Xtra for aggressive applications including chili tuna salads, tomato puree and sauce, and fish in white wine. On the other hand, Mondi Group has a strong presence in the European region on the back of its retort pouches that are lightweight and strong in appearance, enabling easy transportation and impression. If the projections of the TMR report are to be believed, the demand in the global retort packaging market will proliferate at a healthy CAGR of 7.45% during the forecast period of 2017 to 2024. Volume-wise, the report has estimated a demand for 72,492 mn units by the end of 2024, which in turn would reflect a revenue of US$24,706.0 mn. Based on product type, the report segments the retort packaging market into trays, cartons, pouches, and others. The pouches segment has been further sub-segmented into gusseted pouches, spouted pouches, back-seal quad, and stand-up pouches. On the basis of material type, the market for retort packaging has been bifurcated into cast polypropylene, nylon (Bi-oriented polyamide), polyester (PET), polyethylene (PE), aluminum foil, paper and paperboard, and others including PVC and PVDC. Application-wise, the retort packaging market has been categorized into food including soups and sauces, baby food, pet food, sea food, ready to eat meals, and others, beverages, and pharmaceuticals. The market has also been classified based on type of form, into semi rigid, rigid, and flexible. Geographically, Asia Pacific is anticipated to overtake as the most lucrative region towards the end of 2024, producing more demand for retort packaging than other prominent regions of Europe and North America. The retort packaging market is feeding off the flourishing food and beverage industry. The demand for packaged ready-to-eat meals is on the rise among urban populations and manufacturers are resorting to these lightweight and flexible modes of packaging that also go a long way in extending the shelf-life of the products. While stringent regulations against the use of PVC and HDPE materials is hindering the market’s prosperity, the players are indulged in the development of ecofriendly products to counter the challenge. The growing demand from the pharmaceutical industry, and rising applications across pet care products are also expected to reflect positively on the retort packaging market in the near future. Major players are innovating constantly to maintain their stronghold.